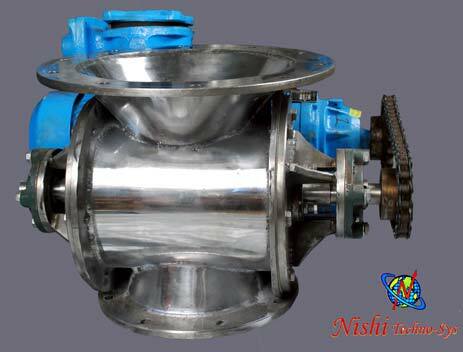 We are a leading Manufacturer and Supplier of Rotary Feeder. It is manufactured making use of supreme quality of raw materials. We make it available in different specifications at request of customers. Its dimensional accuracy, precise design and easy operability make it suitable for different purposes in various industries. This brilliance is offered at pocket friendly rates. Get it delivered at your doorstep at your ease. Rotary Feeder : Rotary Feeder function wise similar to Rotary valve difference is clearance between shell and Vense is 3-4 mm purpose of Rotary Feeder to Feed large quantity material in short time. Mostly it is used in corser material where size of material between 2-4 mm. Process material should not be brittle. Our Std. models are 75mm dia/ 100 mm dia / 150 mm dia./ 200 mm dia and 250 mm dia ( Next Models design as per customer’s requirement. Design of all models are based on Direct Gear Motor with Chain Sprocket drive.